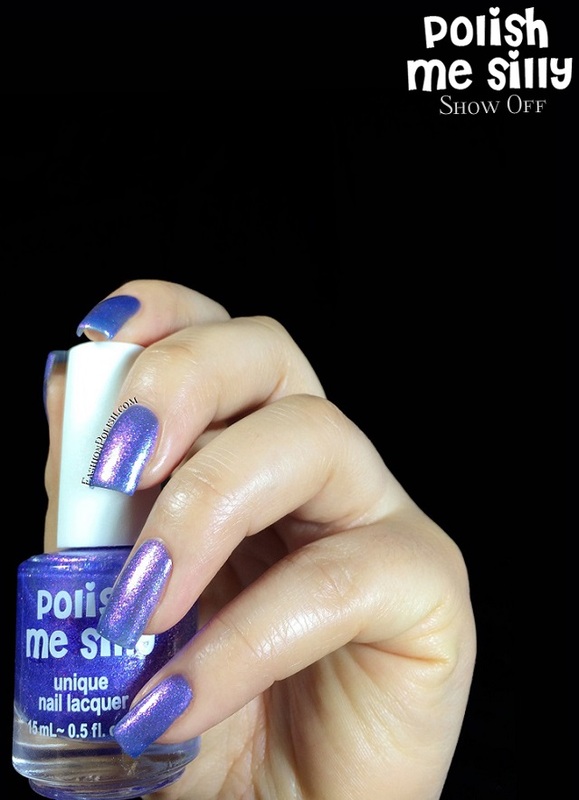 Fashion Polish: Polish Me Silly Meet My Chromies collection review! Polish Me Silly Meet My Chromies collection review! So... Today I have the multichromtastic Polish Me Silly (formerly Lush Lacquer) "Meet My Chromies" collection to show you! If you love duo/multi chromes, get ready for some MAJOR drooling! Formula was really nice and easy to apply on all of these : I didn't experience any dragging or visible brushstrokes. I know some of you prefer to see duo/multi chromes on their own so they are all shown that way apart from the first 5, the ones with the strongest effect, used over black. 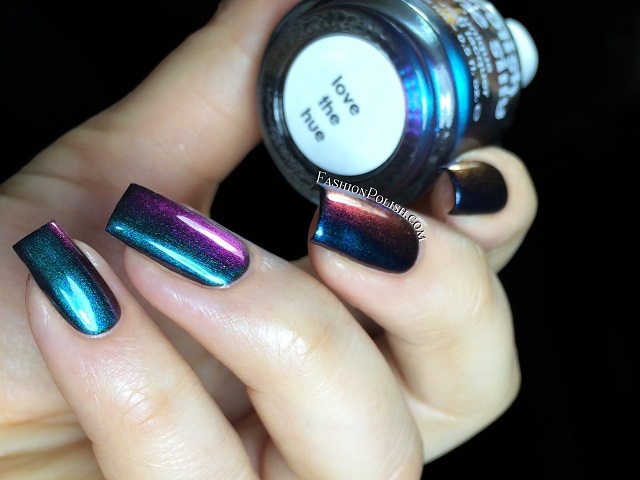 Love the Hue is a multichrome metallic shimmer : turquoise-blue-purple-copper-gold-green. 1 coat over black no topcoat. 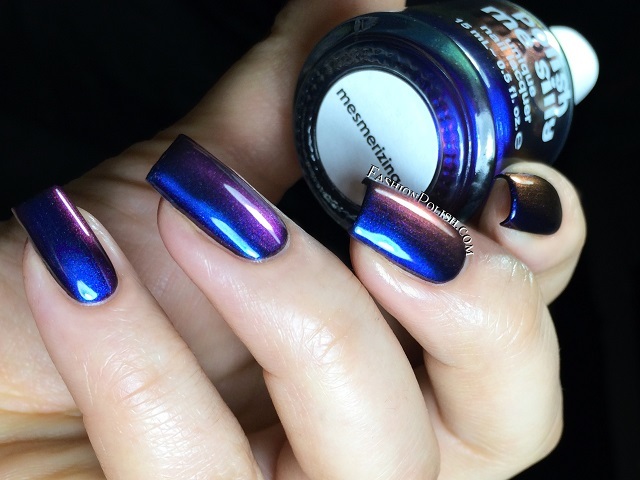 Mesmerizing is a multichrome metallic shimmer : navy-purple-copper-gold-green. 1 coat over black no topcoat. 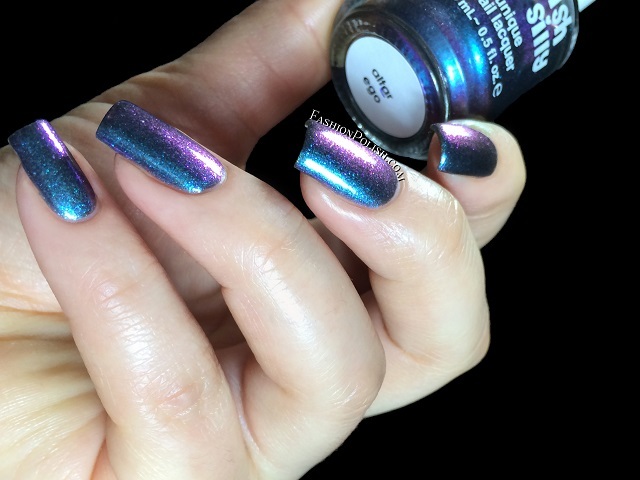 Holy Shift is a multichrome metallic shimmer : blurple-purple-copper-gold-green. 1 coat over black no topcoat. 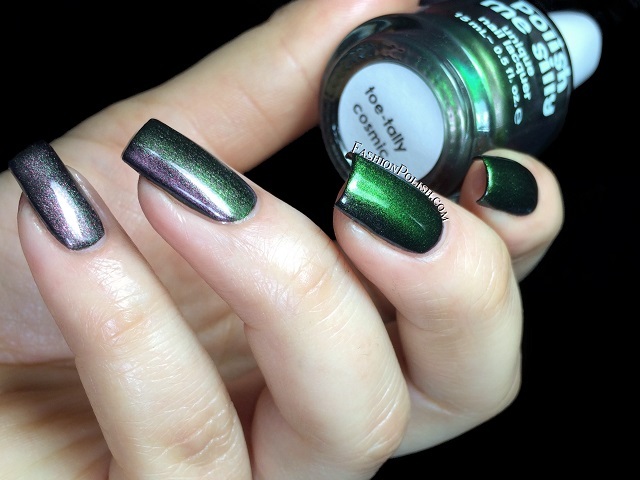 Toe-Tally Cosmic is a multichrome metallic shimmer : grass green-green-mauve-purple. 1 coat over black no topcoat. Guilty Pleasure is a multichrome metallic shimmer : purple-pink-red-copper. 1 coat over black no topcoat. 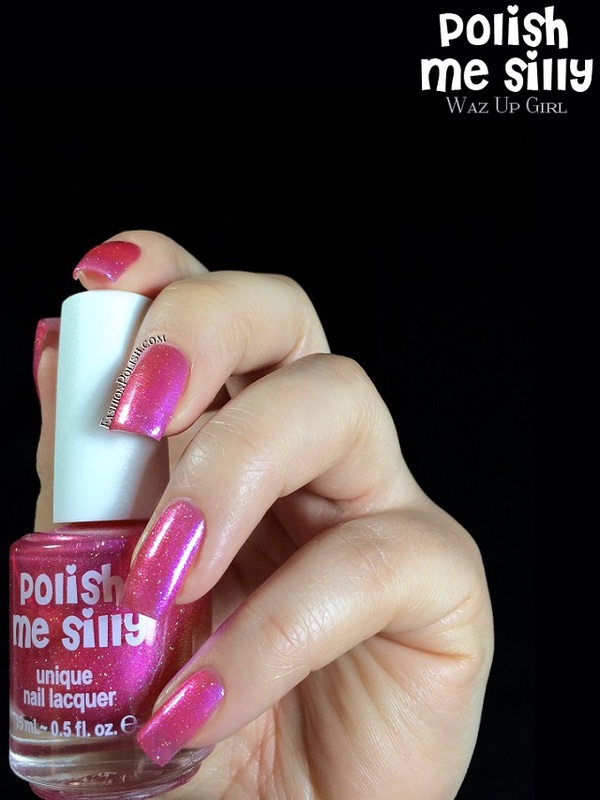 Waz Up Girl is a pink-orange shimmer duochrome with a blue flash in a pink base with extra holographic micro glitters. 3 thin coats, no topcoat. Tease Me is a blue-purple-pink-gold shimmer multichrome in a purple base. 3 thin coats, no topcoat. 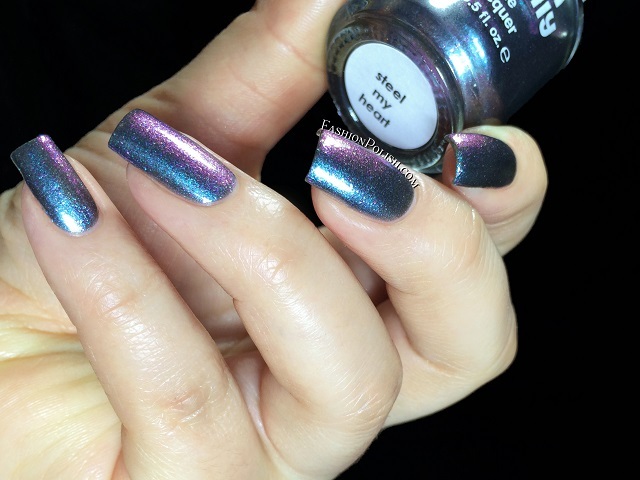 Show Off is a purple base with coarse blue-pink-gold multichrome shimmers. 3 thin coats, no topcoat. 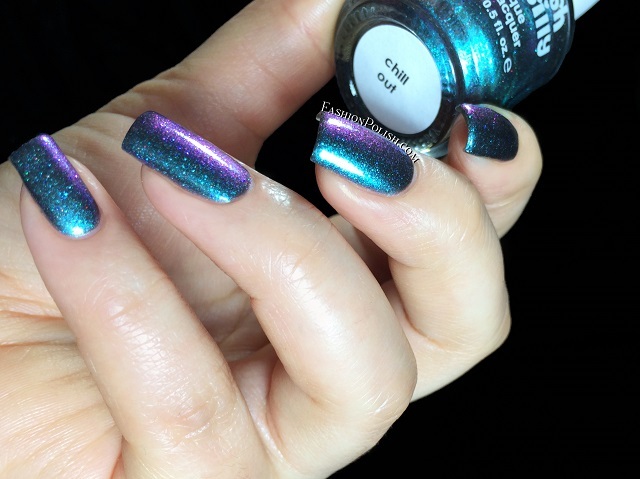 Chill Out is a coarse turquoise-blue-purple-gold multichrome shimmer (mostly turquoise-purple on he nails). 3 thin coats, no topcoat. Steel My Heart is a coarse, greyed-out, blue-purple-gold multichrome shimmer (mostly blue-purple on he nails). 3 thin coats, no topcoat. 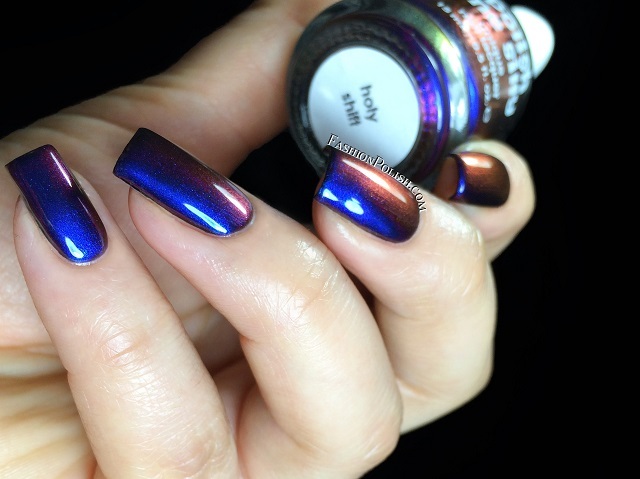 Alter Ego is a coarse navy-purple-copper-gold multichrome shimmer (mostly navy-purple on he nails). 3 thin coats, no topcoat. Turtle Time is a murky turquoise-green-purple-pink multichrome shimmer (mostly green/purple on the nails). 3 thin coats, no topcoat. 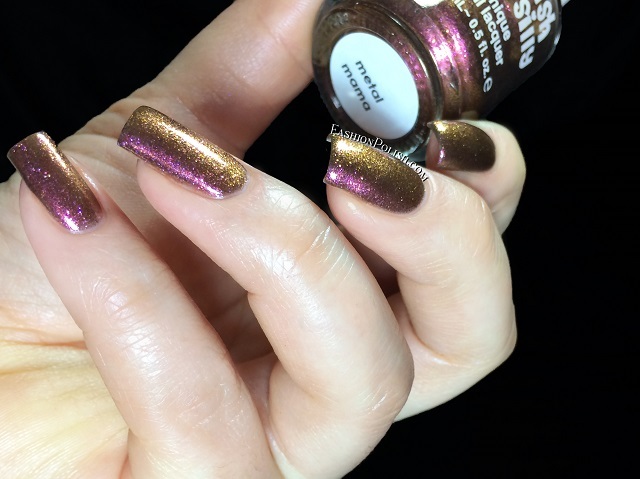 Metal Mama is a coarse magenta-copper-gold multichrome shimmer. 3 thin coats, no topcoat. Cosmic Kisses is a purple-pink-copper-gold multichrome metallic shimmer with red and blue sparkles. 3 thin coats, no topcoat. Blissful Moments is a sheer white jelly with tons of pink and green sparkles, designed as a french manicure topper. 2 thin coats, no topcoat. Hypnotic is a super dense silver sterling flakes topper with an overall platinum/pewter metallic finish. 3 thin coats over foil polish. I can't even begin to tell you how much I L.O.V.E this collection! The first 5 multichromes have one of the strongest color changing effect ever and the coarse shimmer have crazy sparkle! My top picks : Guilty Pleasure and Cosmic Kisses (I've never seen anything like them! ), Holy Shift and Hypnotic!!! 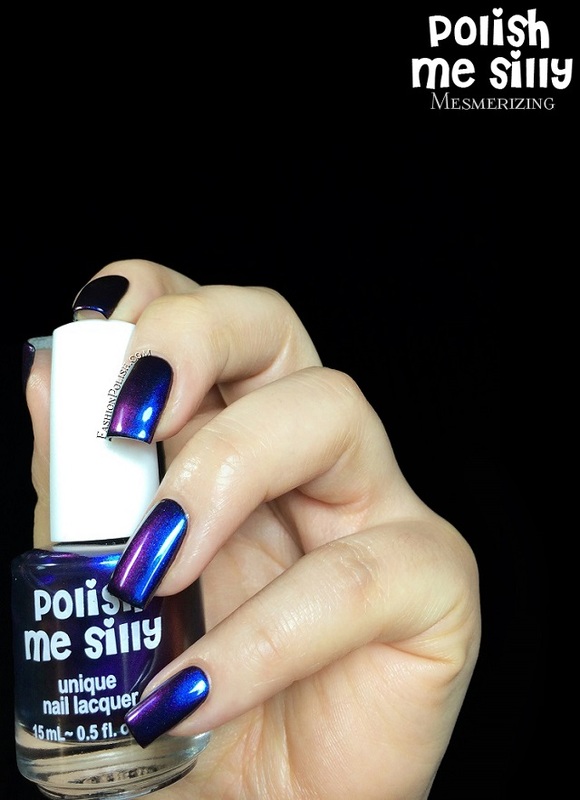 Polish Me Silly can be purchased directly from the brand's Etsy store here and retails for $9 to $13 each. Selected colors are also available in mini size ($5 to $6.50). Make sure to follow Polish Me Silly on Facebook/Instagram for giveaways, upcoming collections and launches information!